Grass River has nine trails that total 7.5 miles including a Rail-Trail bisecting the natural area. Most of the paths are classified as Upland Trails and wind through forests that range from pines to beech, aspen, birch and oaks, making the area a popular destination for fall colors. Three Wetland Trails — Fern, Sedge Meadow and the Dock Access Trail — are the boardwalks that keep your boots dry in the marshes. These provide access into Grass River’s most intriguing habitat. We love boardwalks. Wooden trails keep our socks dry, our boots clean, and our kids out of the doghouse when they inadvertently wear their tennis shoes on a muddy outing. 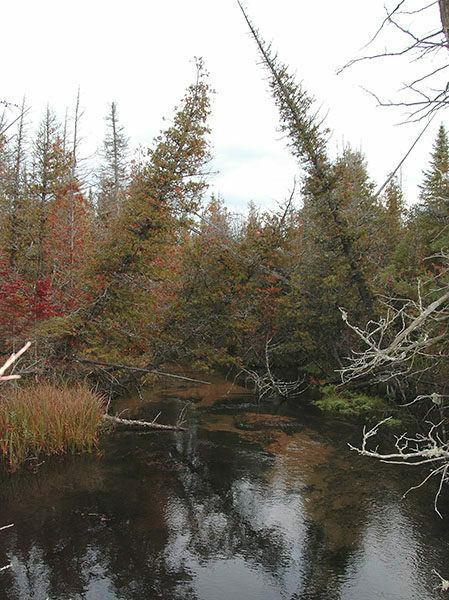 But most of all, where there is a boardwalk there is usually a swamp, marsh, or bog surrounding it. That’s the best part — exploring these environments that are packed with interesting plants and wildlife without being knee-deep in black ooze. 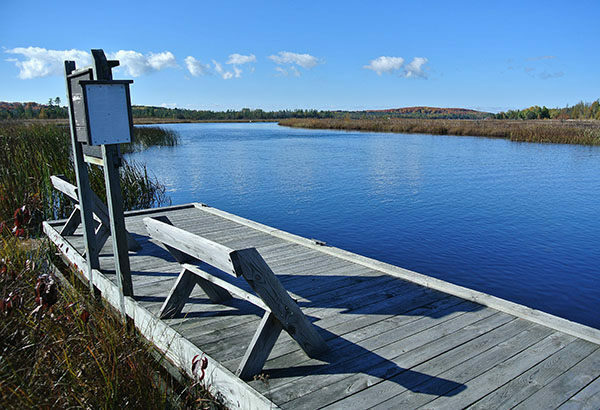 At the Grass River Natural Area there is an abundance of boardwalks — in fact, some trails are nothing but boardwalks, because a good slice of this 1,443-acre park is either sedge meadow, marsh, or cedar swamp. The Grass River itself is only 2.5 miles long and just chest deep. It’s a crystal-clear waterway that connects Lake Bellaire to Clam Lake as part of Antrim County’s Chain of Lakes. But the extensive floating sedge mats and other wetlands that surround the river are so intriguing that they prompted a fund-raising effort to purchase the land and dedicate it as a natural area in 1976. They’ve been building boardwalks ever since. 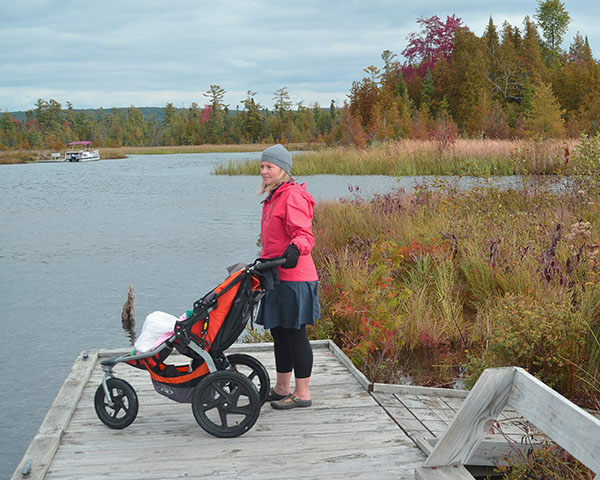 The trails at Grass Lake are, for the most part, interconnected loops of relatively short distances, making them ideal for family outings even with children as young as three or four. Also drawn to the natural area are birders — 147 species have been sighted — and wildflower enthusiasts. 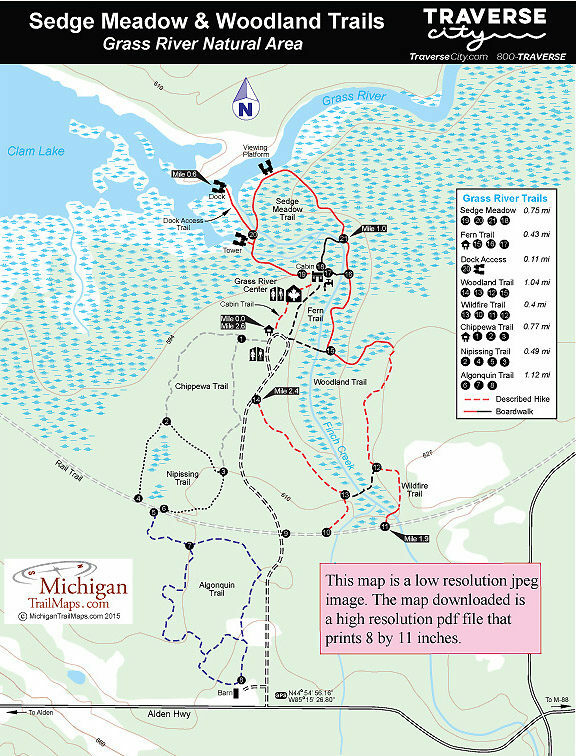 In the winter Chippewa, Nipissing, and Algonquin Trails are groomed for cross-country skiing while all other trails are open to snowshoers. The hike described here is a combination of the Wetland Trails with the Upland Trails of Woodland, Wildfire and a short portion of the Rail Trail to create a 2.6-mile loop. Trails at Grass River are well marked and easy to follow. Mountain biking is banned in the natural area while dogs are allowed only on the Algonquin and Rail Trail and must be on a lease. The main parking lot serves as the trailhead for most outings to Grass Lake as several trails depart into the woods here. Follow the Cabin Trail as it heads north to quickly reach the Grass River Center and then the Cabin within a quarter mile. The impressive Grass River Center is the new education center that was opened in 2011. The Cabin was Grass River’s original interpretive center. Several posts surround the Cabin, including post No. 19 marking the Sedge Meadow Trail. 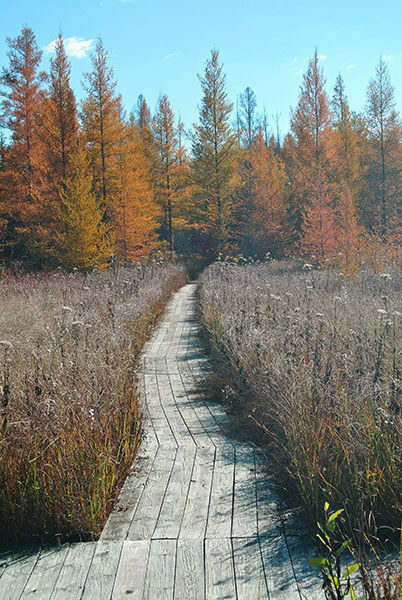 Following Sedge Meadow Trail in a clockwise direction the boardwalk begins in the forest but quickly enter wetland habitat where many plants have been identified. At times you can view showy lady’s slippers and other orchids, floating sedge mats, Labrador tea and bog cranberry. In 0.2 mile the trail emerges at the edge of Grass River where an observation tower has been built while just beyond it is Dock Access Trail marked by post No. 20. The spur leads to another viewing platform and a dock on the river reached at Mile 0.6. To sight wildlife, dawn and dusk are the best times to be here, quietly standing on the tower scanning Grass River, Finch Creek, and the edge of Clam Lake. Wildlife sighted from the tower includes river otters, mink, white-tailed deer, and a variety of bird life including marsh hawks, ospreys, and bald eagles. Backtracking to post No. 20, Sedge Meadow Trail quickly crosses Finch Creek where the massive foot bridge includes benches and then reaches another viewing platform overlooking Grass River. At this point the boardwalks swing south, reaching post No. 21 at Mile 1 and then post No. 16, where you continue south (left) onto Fern Trail. For a 0.3 mile, from posts No. 21 to No. 15 , you skirt Finch Creek with amble opportunities to study the clear stream for whatever lives below its surface. At post No. 15, Mile 1.3, you head east (left) to continue with the Woodland Trail. The boardwalk remains for another quarter mile before a foot path takes over and leads to post No. 12, Mile 1.7, the start of the Wildfire Trail. Along this path you can peer into the wooded ravine that Finch Creek flows through before descending to the creek. You cross Finch Creek on a large foot bridge with benches and then climb to the Rail Trail, reaching post No. 11 at Mile 1.9. Post No. 10 is quickly reached west (right) on the Rail Trail. At the post resume north (right) back into the woods on Wildfire Trail and then continue in a northerly direction (left) at post No. 13. The next 0.3 mile is a level walk through the hardwood forest before you reach the entrance road post No. 14 at Mile 2.4. The trailhead parking is less than a quarter mile north on the entrance road. 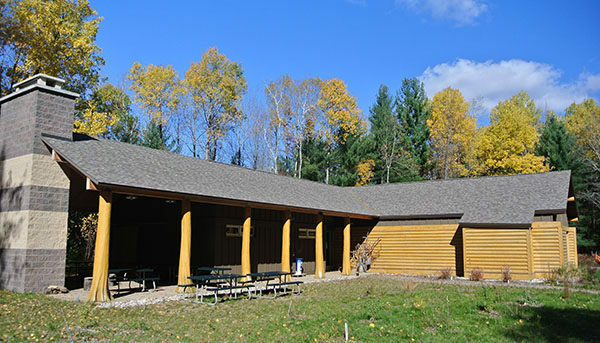 The Grass River Center is open and staffed by naturalists year-round and features restrooms and educational displays. There is also restrooms and drinking water at the Cabin and vault toilets at the main trailhead. Grass River Natural Area is open year round from dawn to dusk daily. The Grass River Center is open Tuesday to Friday from 10 a.m. to 4 p.m. June through August and 11 a.m. to 4 p.m. Saturday and Sunday from September through May. There is no fees to visit the natural area. From US-131 in Mancelona, Grass River Natural Area is reached by heading west on M-88 toward Bellaire. When M-88 swings sharply to the north in 2 miles, continue west on Alden Highway (County Road 618). The entrance road to Grass River is posted along CR-618 before you reach Alden. For more information contact Grass River Center (231-533-8576; www.grassriver.org) or the administrative office for the natural area (231-533-8314). For lodging or additional travel information contact Traverse City Tourism (800-872-8377; www.traversecity.com).